I do not plan to post the recipe here; see LaBau’s book The Sweet Book of Candy Making, Quarry Press, 2012, p.116-117 for more information. Elizabeth LaBau’s Peppermint Swirl Marshmallows are a no-frills basic marshmallow recipe with the addition of a marbling effect on the top done with red food coloring and a toothpick. I had gel food coloring but it was not the type you could “drizzle over the top of the marshmallow in a random pattern.” But I did the best I could. My one regret was I did not block off any time this weekend to temper chocolate and dip these marshmallows — while I was cutting the marshmallows I was thinking, GEE I REALLY WISH I HAD TIME TO DIP THESE IN CHOCOLATE — THEY’D BE AWESOME!! But they’re pretty darned good without any coating. I’ll soon test them in a cup of steaming hot cocoa. 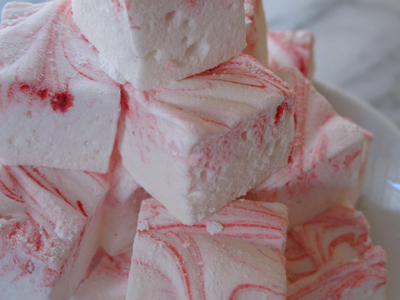 I guess I’ll have to make another batch of marshmallows for dipping in the near future . . .